A documentary which could rewrite New Zealand’s early history screens at the Kumara Box on Pouto Rd, near Dargaville, early next month. Mystery at Midge Bay – The Discovery of New Zealand’s Earliest Shipwreck investigates the theory that the Spanish or Portuguese might have been the first Europeans to discover New Zealand, before the Dutchman Abel Tasman in 1642. The 50-minute documentary, co-produced by David Sims and Winston Cowie and directed by Sims, premiered at the same venue a few weeks ago but, since tickets sold out well before the one-off screening, a re-showing has been arranged. Mystery ay Midge Bay. 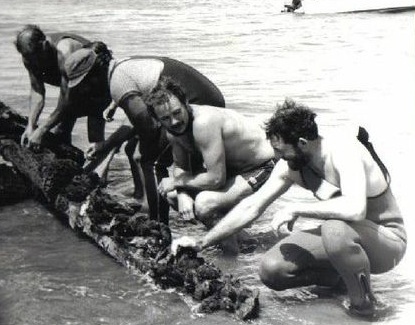 Solaris Films New Zealand Ltd.
Sims and Cowie, who was born in Dargaville, investigated three shipwrecks which local folklore says are linked to early Iberian voyages. The documentary focuses on one in particular, at Midge Bay near the mouth of the Kaipara Harbour. They say they have obtained previously missing scientific evidence regarding this shipwreck. The Kaipara bar and harbour have a notorious reputation and their depths hold many ships’ graveyard secrets. For the full story, written by Annette Lambly of the Northern Advocate, click here. Mystery at Midge Bay will screen for one night only at Matakana Cinemas on Thursday 6 December, at 6:30pm, and The Kumara Box, Dargaville, on Friday December 7 at 6:30pm. Limited seats are available. Please contact the venues for bookings. A Flame Flickers in the Darkness And there are only circa 75 out of 500 copies left of A Flame Flickers in the Darkness, Winston Cowie’s New Zealand historical fiction novel or book based on the New Zealand Wars or Maori Wars or New Zealand Land Wars of the 1860s. You can grab a copy from Whitcoulls, independent bookstores and online on PublishMe and Fishpond.